Good grief ! I see it has been a long time since I put anything into this blog. This entry has little or nothing to do with “tinkering” of any kind, but it may be of interest to some. In any event, the photo shows the rig(s) I was using in April 2012 to sling lightening around the globe. A few “highlights”: The control head for the ICOM 706, which is the rig I use most, is shown near the lower left-hand corner of the photo. The large green objects in the middle of the photo are a SAILOR R1119 on the bottom with a SAILOR S1301 Exciter sitting on top. The exciter is intended to drive an 800 watt amplifier that I do not have. The S1301 has circuitry that blocks usage outside the commercial marine bands, so I can’t use it until I finish converting it for Ham Radio use. The R1119, however, is fully functional, and I use it mostly for SWLing and monitoring the Ham bands. The two small white boxes on top of the S3101 are a home brew 40 meter transceiver on the left and an antenna tuner on the right. The other gear shown here, such as the CW paddle, will be familiar to any active HF Ham Radio operator, so I’ll not say anything about all that. The painting of a harpy eagle in the background is the result of another hobby of mine, and that’s a story for another time. 73 for now . . . 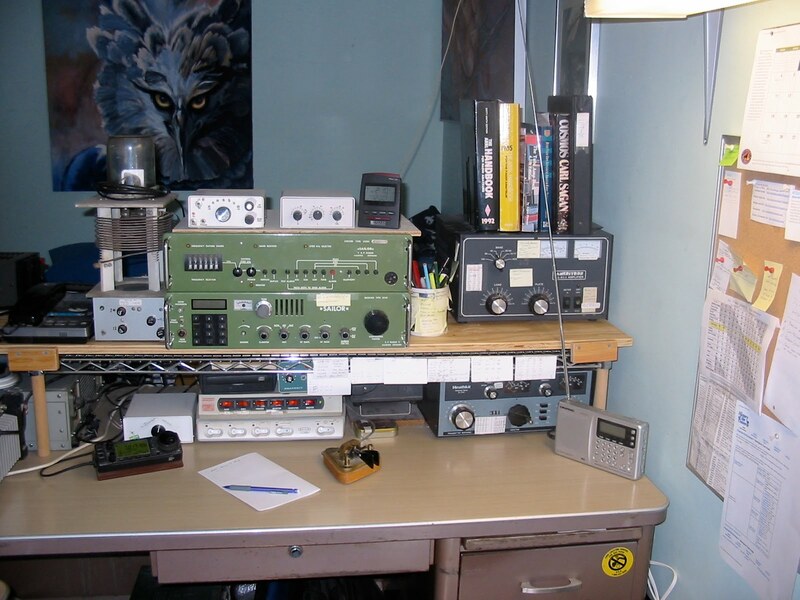 This entry was posted in Ham Radio and tagged Ham Rig, Sailor R1119, Sailor S1301. Bookmark the permalink.